Let’s talk hip health in yoga postures. Specifically, let’s discuss femoral version. Femoral version is a term that has been around for decades, but the utility of it really wasn’t relevant, or so we thought, until the advent of better diagnostic technology that allowed the scientific community to develop measures to prevent premature degeneration of the hip, and as a result, hip replacement surgery. It is thought that hip replacement surgery might have been preventable in a large number of cases had hip arthroscopy been available, as well as the rehabilitation to go with it, in previous decades. Thankfully, we know have advanced ways of not only viewing the hip, but addressing the problems that can plague it, which is making life livable again for the scores of folks afflicted with hip labral and impingement injuries. But what does femoral version have to do with hip health? Femoral version describes the angular measurement of the femoral neck as compared against the distal femoral condyles. Have a look at this illustration below (Figure 4.25) from my text yoga in rehabilitation. In the figure, you can see a person lying on their stomach (prone-lying) with their knee bent (flexed) to approximately 90 degrees. A measurement is taken by palpating (touching) the greater trochanter (the part of the hip you can feel from the side of your pelvis) and centering it up in the middle of the upper thigh by internally and externally rotating the femur until the “centered” position is achieved. The angle you see, as is demonstrated in the photograph, is called the femoral version angle and can be taken with a digital or manual goniometer from the vertical axis of the tibia or a horizontal level line drawn between the two distal femoral condyles. A “normal” range for femoral anteversion, which is what the normal femur should possess, is between 8-15 degrees from the vertical, where the femur is slightly internally rotated. Anything above that measurement (greater than 15 degrees), is considered excessive femoral anteversion, and anything less than roughly 8-15 degrees (I typically use 15 degrees as a cutoff) is considered femoral retroversion. Seem complicated? Watch my FREE Femoral Version Screen Test also known as the Craig Test. In it I demonstrate two variations on how to pull an accurate measurement. ©2016. Medical Therapeutic Yoga. Garner, G. Handspring Pub. Ltd., UK. All rights reserved. Used with permission from Ginger Garner and Handspring Publishing. Now, what does that mean in plain English? It means that, through CT scan studies, femoral version can be correlated with a loss of normal physiological osteokinematic range of motion. That is to say, if a person is found to have excessive femoral anteversion, he or she will likely have limited external rotation. If a person has femoral retroversion (any amount is considered excessive) then she or he will have limited internal rotation. This has profound implications for the practice and prescription of yoga, whether when used by a yoga teacher, yoga therapist, or healthcare provider in clinical or wellness practice. Let’s apply the implications of femoral version practically, with an assessment of Triangle Pose, one of the biggest offenders of the hip and certainly one of the most commonly mistaught or malpracticed yoga postures. Second, there are a few universal cues that should immediately be forever banned from triangle posture instruction vernacular. These cues tempt injury, and some are just flat-out anatomically impossible, a kind of cruel biomechanical joke. The offense of the FIRST THREE “NEVER-USE CUES” is that they are the equivalent of biomechanical torture. In other words, the position suggested by these cues may be possible for some hyper mobile or incredibly retroverted (femoral) hips, but it is not safe and not sustainable. It invites injury on multiple levels, especially to the bony, capsular, ligamentous, and labral components of the pelvis and hip. The LAST THREE “NEVER-USE CUES” could be applied to many postures and not just triangle, because they needlessly needle a student to push, strive, and reach for a sort of perverse “physical perfection” in a pose. But guess what, “perfect poses” don’t exist. Especially in triangle pose, where safety and prevention of hip impingement or labral injury is paramount, alongside health of the sacroiliac joint, iliolumbar ligaments, pelvic floor, and soft tissue of the hamstrings and adductors, just to name a few. Next, look at the juxtaposition of Triangle pose aligned in a healthy way (Figures 3.20 and 3.21) and one that encourages what I call a “TRIFECTA OF INJURY” (Figure 6.38) for the general population. The “Trifecta” is what I call the combined movements of spinal flexion, rotation, and side bending over a long level arm (moment arm of the head balance on the end of the spine) introduced in a vulnerable standing position that (unnecessarily) seeks extreme hip range of motion. The locks described in Figure 3.20 are explained in detail in my textbook, however, for this post just know that use of the Locks System is a critical key to creating the stability needed for safe performance of triangle pose. The locks provide internal support for triangle pose, and many others, however a discussion of locks deserves its own post, and occupies a large section of Medical Therapeutic Yoga as a foundational precept for use of yoga in safe programming. I’ll be posting in the future on the Yogic Locks System. Figure 3.20 demonstrates a triplanar action of triangle pose, the foundation of safe performance. This means that the trunk is kept in a relative spinal neutral position, along with the sacroiliac joint, because the pelvis is in a transverse plane (NOT forced to be square or “between 2 panes of glass.”) There are modifications that would need to occur, chiefly flexion at both knees, in order to adapt the pose to someone with excessive femoral anteversion or femoracetabular impingement (false or actual). The person with femoral retroversion (an angle less than 8-15 degrees femoral anteversion) may still need to adapt this pose by avoiding end range of motion at the hip (since they tend to have excessive hip external rotation and very limited hip internal rotation). The back knee may need to be flexed 5-10 degrees in order to mediate the pelvic obliquity required in this transverse position, which would create a hip internal rotation and adduction moment, not a happy position for those with measured femoral retroversion. (c) 2016. Garner, G. Medical Therapeutic Yoga. Handspring Pub. Ltd., Scotland, UK. Reprinted with permission. All rights reserved. Figure 6.38 demonstrates the “TRIFECTA OF INJURY,” one of the ways that triangle pose is often performed and taught. The pose should not be taught to those without first mastering the postures outlined in MTY, and at the very least mastering Abdominodiaphragmatic Breath (AD) and TATD Breath. If you have difficult learning the breath types and tend to chest breathe or find tension in the head, neck, and/or face, try practicing on THE YOGA COUCH. Next, in those with a history of low back pain, hip pain, pelvic pain, or sacroiliac joint issues, or in those with muscular weakness or lack of awareness, in addition to the inability to demonstrate mastery of A-D Breath and TATD Breath, avoiding this particular “TRIFECTA” alignment becomes paramount. This is because there is a lack of internal support to perform the pose, and the long moment arm and load of the trunk is a disadvantageous lifting angle. Think safe lifting “101” where we are all taught to lift with our legs not our backs. The same old proverb holds true here, especially for those with the aforementioned issues. Performing the pose as in Figure 3.20 or 3.21, or using any of the many adaptations given in my textbook, maximizes potential for optimizing pressure between THE THREE DIAPHRAGMS (vocal/thoracic, respiratory, and pelvic). Discussion of the three diaphragms is also outside the scope of this post but is something I will be covering in future posts. The “Trifecta” is just one of a few ways that triangle can go awry. Some of the others are in using dangerous cues listed above, such as the “panes of glass” cue or the “reach further” type of cues. Avoid end range of motion in all poses, not just standing postures. Flex the knees in postures like Warrior I, II, Triangle, Extended Side Angle, and Revolved Triangle. Use a triplanar alignment for Triangle pose, as well as Extended Side Angle pose. Warrior I, II, and Revolved Triangle use a different alignment, which will be addressed in future posts. Practice the FREE VIDEOS which accompany the Medical Therapeutic Yoga text, which give precaution, indications, and contraindications for standard yoga postures. Half of the videos are FREE and are accessible HERE. I have included in this post. Pick up a copy of Medical Therapeutic Yoga to guide your own personal or professional practice. 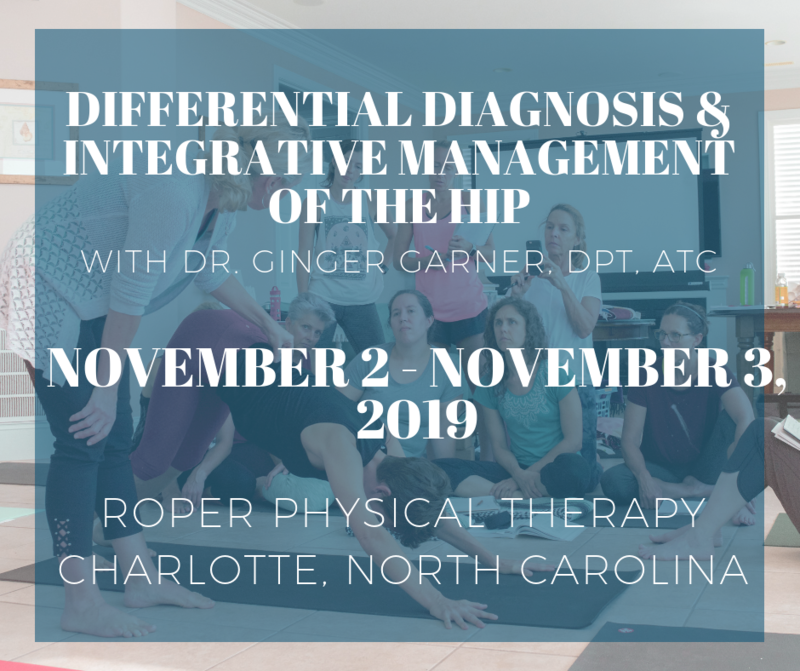 Visit and sign up for my blog at www.gingergarner.com, Yoga Hip(py), which gives guidance on using yoga for, and rehabbing from, hip labrum or impingement-driven injuries. *Note that assessment and evaluation of the hip joint should be done by a licensed healthcare provider, preferably a physical therapist or orthopaedist. It may be possible for a yoga teacher to screen healthy range of motion in the hips, but assessment and evaluation would be beyond her/his legal capability. **Please refer to Medical Therapeutic Yoga for citations, and more information, including instruction, and scientific evidence-base and rationale. Please lease feel free to leave your comments below the blog. I am really astonished to read this awesome article, i appreciate your hard work on it and recommend this article to friend. Amazing information and Thanks for Sharing. Thank you Mary for your feedback – I am so glad you found the article beneficial! Thank you for sharing. Always welcome and looking for more interesting article. At the time I was having back pain and felt that the lack of internal rotation in my hip joints was not allowing me to perform the necessary exercises to heal my back. The practitioners I saw at the time had no clue about the significance of femoral version but intuitively I felt that it was the core of the issue. I was diagnosed with FAI (Femoral acetabular impingement) and according to the doctor I saw I would gain more internal rotation if I had the arthroscopic procedure done to correct the FAI. Desperate and ignorant at the time, I went through with the procedure. It ended up doing nothing. I have been doing yoga for many years, since my early 20s. Some poses, due to my extra-ordinary ability to externally rotate my hips, are quite easy. Other poses that involve deep internal rotation of the hips are difficult for me, especially in the right. It has been a source of frustration for me every time I start a regular yoga practice again. I am seasoned enough as a yoga practitioner to understand the mechanics and subtle actions of poses (I also went through an Iyengar influenced teacher training back in 2012). When I practice a pose that involves deep internal rotation, such as Parivrtta Trikonasana, or Rotated Triangle Pose, I find that the soft flesh wants to internally rotate, but the bone wont let it. Sometimes I do it anyway within my capacity but then doubt arises because I can feel the “bone on bone” and it feels damaging. I love yoga and asana practice and I don’t want to to let it go. I am going to purchase your book and study it and follow the guidelines and I hope that I can find modifications to help me with my practice. Also, I haven’t been to a doctor to get my hips evaluated since the arthorscopic FAI sugery I had in 2007 because I had such negative experiences with doctors back then that I don’t want to deal with them again unless it’s absolutely necessary. I don’t have significant pain, thank goodness. So aside from getting your book and learning more about femoral retroversion, do you have any other suggestions for a person like myself with extreme femoral retroversion for hip care and prevention of excessive wear and tear and avoiding hip replacement further down the line? Thank you so much for your time and for your work. Thank you for taking the time to share your story and to respond to this post. To answer your question, the simplest approach – and the only one I can give without having a patient-provider relationship, is to avoid extreme ranges of motion in both internal and external rotation. Unfortunately, yoga is notorious for emphasizing external rotation – and some poses like hero and even forward standing bend can require end range internal rotation for folks like you with femoral retroversion. I would be concerned for both your labrum integrity and capsule – which are the first lines of defense for pressurization of the joint. Once that is lost – premature joint degeneration ensues. The best way to avoid hip replacement is to avoid those end ranges of motion in rotation of the hip – and to stay in a midrange that is always pain-free and that never recreates FAI pain or sensations. I hope this helps – and I wish you the very best for joint replacement prevention. And, in your yoga practice, may you be injury free! I have no words to appreciate you over a comprehensive article for us.